The hide-and-seek game has many interesting aspects for studying cognitive functions in robots and the interactions between mobile robots and humans. Some MOMDP (Mixed Observable Markovian Decision Processes) models and a heuristic-based method are proposed and evaluated as an automated seeker. MOMDPs are used because the hider's position is not always known (partially observable), and the seeker's position is fully observable. The MOMDP model is used in an o-line method for which two reward functions are tried. Because the time complexity of this model grows exponentially with the number of (partially observable) states, an on-line hierarchical MOMDP model was proposed to handle bigger maps. To reduce the states in the on-line method a robot centered segmentation is used. In addition to extensive simulations, games with a human hider and a real mobile robot as a seeker have been done in a simple urban environment. 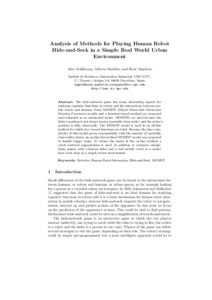 Goldhoorn, A.; Sanfeliu, A.; Alquezar, R. Analysis of methods for playing human robot hide-and-seek in a simple real world urban environment. A: Iberian Robotics Conference. "ROBOT2013: First Iberian Robotics Conference, Advances in Robotics, Vol.2". Madrid: Springer, 2013, p. 505-520.